A new device or piece of equipment may be dynamic and powerful. But without the user being aware of all its capability and understanding how it operates, its full potential cannot be realized. Thorough training, therefore, is critical when it comes to implementing a manufacturing software package, and more specifically, enterprise resource planning (ERP) or job shop software. Regardless of the scale in which a job shop or ERP software system is deployed, there is always an initial learning phase where end users work to become familiar with a program’s functionality and navigability. With all of the time, effort and resources a business invests in ERP or manufacturing software and its implementation, it is in the best interest of everyone involved for users to become proficient in its operation as quickly as possible. This is where training and education take center stage. 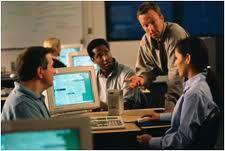 Look for manufacturing software vendors who provide training options. Thorough and attentive training is critical to a smooth transition into a new system. Inadequacies from a training and education standpoint often bring a software company’s credibility into question. Therefore, it is highly advantageous to all parties for software companies to offer comprehensive training and education programs to ensure that customers reap the greatest possible benefits from their products. Look for manufacturing software vendors that offer a multi-tiered training program during and after the implementation of their E2 software system. This includes onsite training, classroom education, advanced training and ongoing consulting and technical support services. On the customer’s end, cutting corners in the area of training can prove to be costly on multiple levels. It will more often than not cause delays in user competency and effectiveness. So budget time for training — to whatever extent may be necessary — during the software implementation planning process.